You are here: Home » Accessories » 5 Unusual Jewelry Materials: Diamonds in the rough! The image above is not exactly diamonds, but of course, those brilliant sparkly things are among the first things that pop into your mind when you think of jewelry. No? Is it gold? Rubies? Emeralds? Sapphires? Silver? But not all jewelry are precious stones. Remember that they started out as being solely decorative pieces, the only standard being that the materials should be pretty enough, regardless of their precious or semi-precious quality, regardless of their extracurricular skills of also being able to resist bullets of course. Goldstone. It is a kind of glittering glass made from low oxygen environments. It looks like water and glitters in tiny thumb-sized containers. Goldstones are not gold; instead they are more traditionally reddish brown with little flecks of metallic copper crystals, from which they get their color. They are not a natural material, although they are usually interpreted as such. They are manmade, invented in seventeenth century Venice. They can be carved into beads, and figurines, and can even come in green! Beetles. Don’t cringe. But beetles have been used as jewelry for thousands of years! 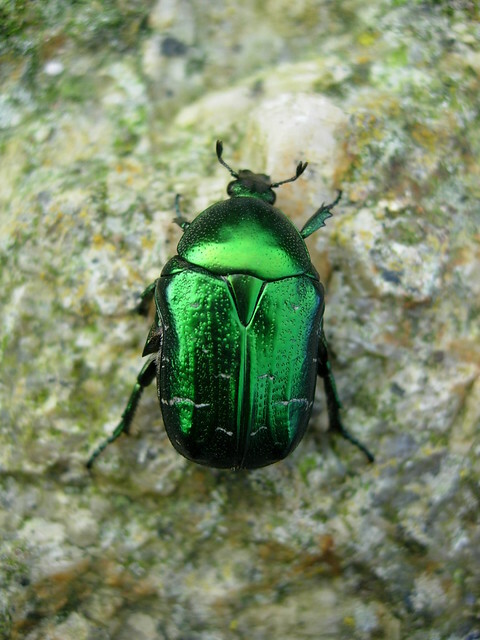 Scarabs were used as jewelry in ancient Egypt, as well as also being considered sacred. Grecian women put cicadas in their hair because they were so rare; and thousands of beetle wings have been used to adorn the dresses of queens and stage actresses, and beetles’ brilliant wing cases have been used as earrings and necklaces in some places like South America. Recently, a trend of decorating live beetles with precious gemstones then putting them on leashes have come up, how’s that for decoration? Rocks. This puts the saying “put a rock on my finger!” to whole new levels. Diamonds, although they are technically rocks, are classified as a precious stone, compared to the more humble hunk of rock that you would normally use to skip over water or trip over while walking. But with just the right amount of ingenuity, even those kinds of rocks can be used as jewelry. Weathered rocks found in beaches, riverbeds, and even glaciers have been common haunts for jewelry makers and hobbyists, with points up for texture and color. And since rocks tell time in centuries, you can literally see back through time! Glass. This material has been, at one point, so precious that knowing how to make it has been monopolized for centuries! Thankfully, it is now a commodity, but we still get to enjoy it in its various forms. Glass beads are the most popular, and they come in all shapes and textures and colors and sizes. Sea glass is another popular material; it is simply weathered glass found on beaches, having accumulated an amount of ‘frosting’ or translucent frosty effect. It is fun hunting for them on the beach! Shells. You’ve seen them used even as lingerie. But all jesting aside, shells have been used as jewelry since the dawn of time. Their allure comes from their naturally intricate designs and the fact that they conveniently just wash up on the seashore or are discarded after a meal. Shells are also used for Cameo style jewelry. You’ve seen the lot; on high necked necklaces and chokers, done by carving designs by the layer, and making use of a shell’s many colors. Author Sharon Sussman isn’t a stranger to the aformentioned materials, but she is more inclined towards the traditional medium of silver, gold and platinum in creating beautiful diamonds engagement rings as Director of Product for Brilliance. See her latest article on How to Put Class in a Las Vegas Wedding, only on WeddingPlannerBookHQ.com. Rough diamonds are often used metaphorically to refer to something, with a little spit and polish, has the potential to become bigger and better or more beautiful.